A large-screen smartphone that's heavily focused on multimedia and photography, the Samsung Galaxy A70's biggest pros include a flagship-class triple rear camera that calls up Phonerated's list of the best photography smartphones around. Its triple-lens setup combines a high-resolution 32-megapixel primary lens with a 5-megapixel depth sensor (mainly for bokeh shots) and an 8-megapixel 123-degree-wide camera for landscape shooting. 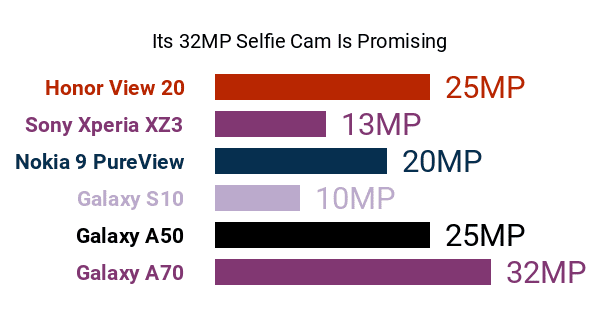 On the flip side, it boasts a whopping 32-megapixel f/2.0-aperture selfie camera whose raw pixel resolution was among the highest on the market as of its April 2019 announcement. Check out some other high-tier selfie-first smartphones here. 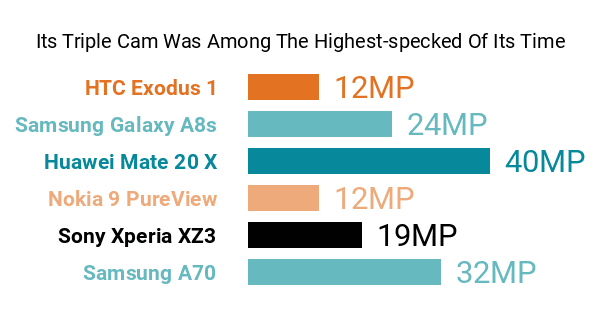 Those ambitious specs aside, the Galaxy A70 still has its fair share of cons, one of which is its 128GB-only internal memory , if only because a few tantamount models from competing brands start out with 256GB of native storage. Note, though, that it comes with support for up to 512GB's worth of external memory. 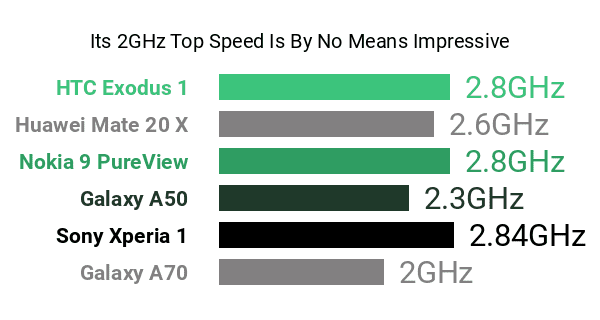 Another slight flaw is its dual-cluster eight-core 2GHz + 1.7GHz processor , knowing that a lot of other 2019-released octa-core phones boast engines that clock in at around 2.6GHz. Nevertheless, its hardware pros and cons hit 2019 flagship-yardsticks, with an 8GB RAM (A 6GB version is also offered) and a robust 4500mAh battery joining the mix. Although the A70 does not shoot for a QHD/QHD+ (1440p) definition , which some of the best phablets offer, its expansive display still makes the high-end cut as of this on-paper review, coming in the form of a 6.7-inch Super AMOLED Infinity-U display sitting on a 20:9 aspect ratio and a 2400 x 1080 sharpness. It also dons Samsung's signature 3D glasstic finish, though some users might consider it inferior versus the all-metal physiques touted by some of its cousins in the Galaxy S family. Adding to its pros and cons is an on-screen fingerprint sensor , facial recognition, and standard Samsung preloaded apps like the Bixby mobile assistant and Samsung Pay. With the Android 9.0 Pie platform topping it off, the Galaxy A70 caters to shoppers eying a multimedia-driven smartphone packing some competitive imaging perks.